Placemats and coasters are a valuable addition to the home, offering a great combination of practicality and decoration. Placemats and coasters will protect your furniture from scratching, staining, discolouration and general wear-and-tear. There are several materials that are used to make placemats and coasters, along with hundreds of designs to choose from. It is just as important to choose a coaster or placemat based on its properties as it is to choose a design that suits you and your home. 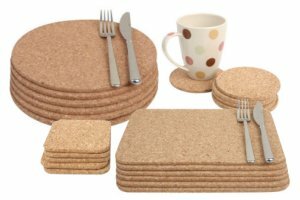 One of the most common and also most popular materials used to make placemats and coasters is cork-backed hardboard. The manufacturing process incorporates 4 layers – the cork as the base layer, followed by the hardboard which gives the placemat or coaster its rigidity and strength, then comes the design which is going to adorn the mat which is then finished with a heat-resistant laminate layer. 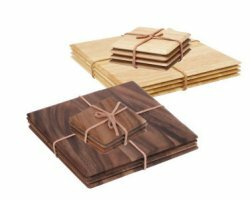 The cork layer makes the placemats or coasters non-slip whilst also providing a degree of protection for your furniture or table. Although it is not recommended that cookware taken directly from the oven is placed on the mats, they are heat resistant up to 110ºC (225ºF). The laminated layer also means these mats can be easily wiped clean with a damp cloth. All placemats and coasters made by Jason Products and Pimpernel use cork-backed hardboard and the use of this material plays a huge part in their reputations as some of the world’s best manufacturers of tableware. Cork is often used on its own to make placemats and coasters. Cork is very close to being impermeable and its natural heat-resistance makes it ideal for the purpose. Cork placemats and coasters from T&G Woodware include square, round and rectangular designs along with mats in the shape of chickens or sheep. All T&G cork products are made from FSC®-certified cork. FSC®, or the Forest Stewardship Council, is an international, non-governmental organisation dedicated to promoting responsible management of the world’s forests. T&G also make coasters and placemats from solid natural wood, either Hevea or Acacia. Hevea is a hardwood from the Maple family which is naturally dense and durable. It is highly unlikely that Hevea will warp, crack or shrink. Acacia is durable, moisture-resistant and solid. The distinctive and rustic grain of natural wood is as timeless as the wood is long-lasting, resulting in tableware that will provide many years of service. 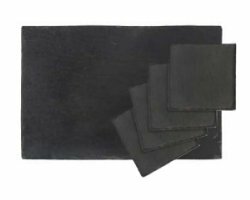 Another natural material used to make placemats and coasters is slate. Slate has become very fashionable in recent years and it is ubiquitous in modern kitchens and dining rooms. However, it is not just aesthetics that have made slate a popular choice for this purpose, due to its natural formation under heat and pressure it is strong, heat-resistant and non-porous. Other materials such as melamine, glass and fabric can be used to make placemats and coasters. Melamine is a robust and easy-to-clean material which is often backed with a velour covering to prevent it from slipping on furniture. Toughened glass placemats and coasters are stylish and functional; they are virtually unbreakable as well as being heat-, stain- and odour-resistant. Faux leather placemats and coasters are a contemporary addition to the table and feature a variety of designs such as mosaic, tile or floral prints. There are hundreds of designs to choose from across the ranges of placemats and coasters, varying from floral to food, animals and birds to scenes and landscapes, as well as plain and decorative designs. Finding the right design is a matter of personal taste and preference, but if you should require further assistance choosing the right design for your please don’t hesitate to call our dedicated customer service team on (01432) 377089 and we will be only to happy to help find the perfect placemat or coaster for you. coasters, Denby, Jason Products, Pimpernel, placemats, Portmeirion, T&G, Tradestock. Bookmark.